Aims: The aim of the study was to access the oral health knowledge, attitude, and practices among pharmacy students in Chennai. Settings and Design: This was a descriptive, cross-sectional study. Subjects and Methods: The descriptive, cross-sectional study was conducted among pharmacy students in Chennai. The questionnaire was to access the knowledge and practice toward oral health. Statistical Analysis Used: Statistical Package for the Social Science (SPSS). Results: 47.8% of the participants considered regular visit to the dentist is necessary. 64.8% of the participants have been professionally taught to brush. 31.9% of the participants prefer government hospitals for their treatment. Conclusions: There is a need for the comprehensive educational program among pharmacy students to promote oral hygiene and to impart education about oral hygiene practices. The role of pharmacists has expanded and evolved with time and not is restricted to only dispensing medication to the patients. Pharmacists are now an important member of the primary health-care team and hold a great potential to expand their role in oral health promotion. They are often the first "PORT OF CALL" for the public to seek general health advice or oral health advice. In fact, the pharmacists actually come into contact with more people with dental problems than an average dentist does. Based on these reports, it is obvious that pharmacists play an important role in oral health promotion. Hence, the aim of the study was to access the knowledge, attitude, and practice of pharmacy students of various Private Pharmacy Colleges in Chennai. This descriptive, cross-sectional study was conducted among Diploma in Pharmacy students in Chennai, in August 2015. The study was approved by the Institutional Review Board, and permission to conduct the study was given by the Ethical Committee of Priyadarshini Dental College and Hospital in Thiruvallur District. The estimated sample size for the study was 270 determined by "G" Power statistical software (IBM Corp., Chennai, Tamil Nadu, India) based on 80% power with an alpha error of 0.05. There are 19 pharmacy colleges in Chennai. Among those 19 colleges, we randomly selected five colleges. Prior approval was obtained from the principals of concerned colleges. The study population included both 1 st and 2 nd year of Diploma in Pharmacy students and those who were willing to participative the study. The structured closed-ended questionnaire consisted of twenty questions was designed and validated using pilot survey with twenty subjects in a pharmacy college. It was prepared in English in such a way that it includes demographic data such as age, gender, and questions on knowledge, attitude, and practice toward oral health. The questionnaire consisted of questions with two sections. The first section contained questions to assess the oral hygiene practices and the second section contained questions to assess the knowledge and attitude toward oral health among pharmacy students. The questionnaire was distributed and the participants were briefed about the aim of the study, and they were asked to indicate their responses. They were instructed to give their own answers and consultation was not permitted. After answering, the questionnaires were collected for evaluation. The collected data were entered in Microsoft Excel sheet. The data were analyzed using Statistical Package for the Social Science (SPSS) software version 21 (IBM SPSS statistics, Chennai, Tamil Nadu, India), and the descriptive statistics such as number and percentage were calculated for the collected data. Mann-Whitney U-test, which is a nonparametric test, was used to find out the significance across gender about knowledge, attitude, and practice toward oral health among pharmacy students. A total of 270 study subjects participated in the study. Out of 270 participants in the study, 110 (40.7%) were male and 160 (59.3%) were female. The age group of the participants ranged from 16 to 24 years. [Figure 1] shows the frequency of dental visit. 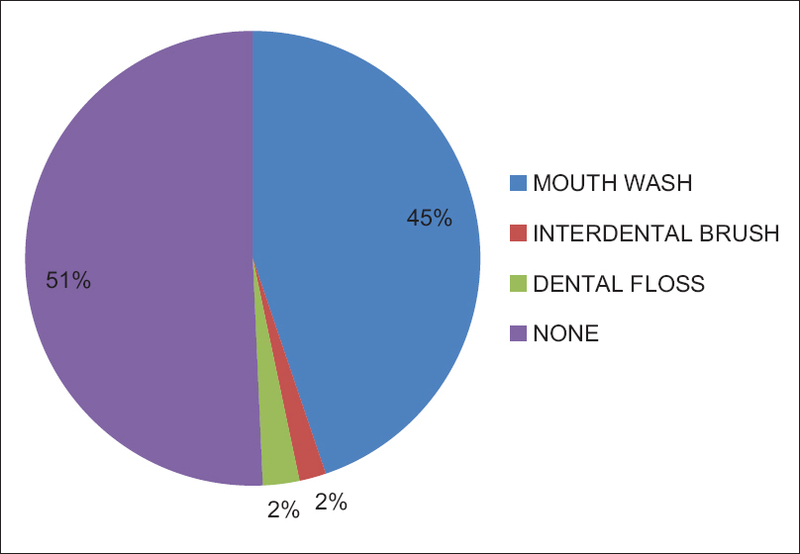 [Figure 2] shows the various oral hygiene aids used by the study population. 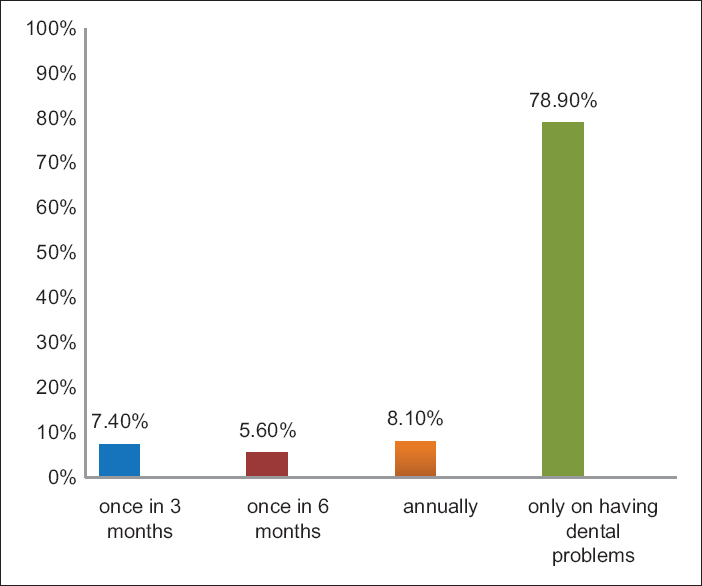 [Figure 3] shows the reasons for not visiting the dentist. 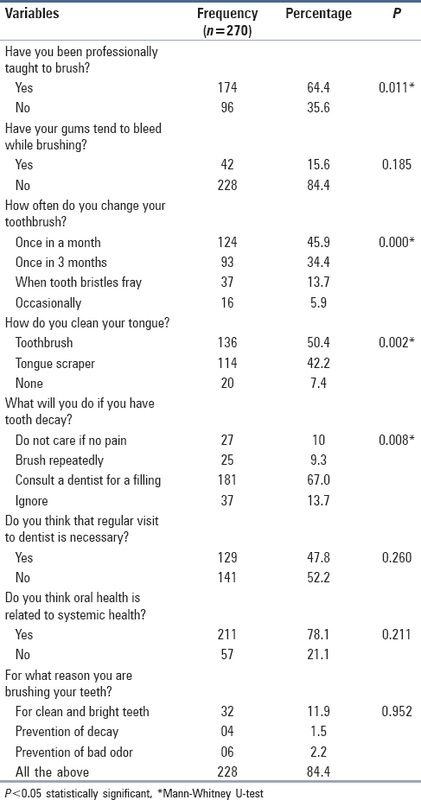 Knowledge and attitude toward oral health among study population are shown in [Table 1]. 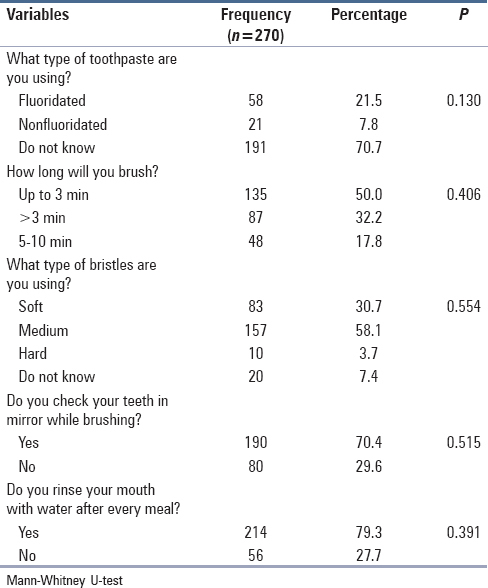 Practice toward oral health among study population is shown in [Table 2]. The present study has revealed the general opinion that oral hygiene has still remained as an ignored and unrealized major social problem. The majority of the people are unaware about their relationship between oral hygiene and systemic diseases or disorders. Preventive oral health education is in transitional stage in India. Population-based oral health promotional programs are yet to be implemented and followed. Hence, in this study, attempts were made to describe the preventive oral knowledge, practices, and behavior of the pharmacy students. Oral health knowledge is required for the pharmacy students to educate and motivate good oral hygiene within the community when they start working in the health-care system. As being their health-care professional, their attitude not only affects their own oral health behavior but also influence the health behavior of the patient and community. The present study shows about 58.9% of the pharmacy students had not visited the dentist before which is higher as compared to the study conducted by Usman et al. among paramedical students in Mangalore, which was only 20% who had not visited the dentist before. This is due to strong reliance of self-care on oral health neglects them from visiting the dentist. Only 15.6% of the pharmacy students had bleeding gums which is less as compared to the study conducted by Kumar et al. among pharmacy students in Saudi Arabia, which was 26%. Furthermore, results of the present study are in contrast with the study by Nirmala et al. where 44% of the pharmacy students had bleeding gums. This shows that the pharmacy students in this study paid good attention to their oral hygiene maintenance. In the present study, about 44.8% of the study subjects used mouth rinse and 2.6% used dental floss which is very less as compared to the study conducted among pharmacy students in Malaysia by Mohid-Dom et al. was 26% used mouthwash and 10% used dental floss on regular basis. Awareness regarding the use of floss is low in this study. The use of oral hygiene aids as a preventive tool is not very much popular among the pharmacy students, which are due to lack of oral health awareness. About 21.5% of the students use fluoride toothpaste which is less as compared to the study conducted by Rajiah and Ving  among pharmacy students in Malaysia was 83.8% use fluoride toothpaste. This is due to the fact that the students lack their knowledge on selecting the dentifrices and role of fluoride in caries prevention. The present study reveals that around 78.9% of the students visit the dentist only on having dental problems and 5.6% of students visit dentist every 6 months, which is in contrast to the study conducted by Usman et al.,  were 87% of the students visit dentist on having dental problems and 6.7% visit dentist every 6 months. 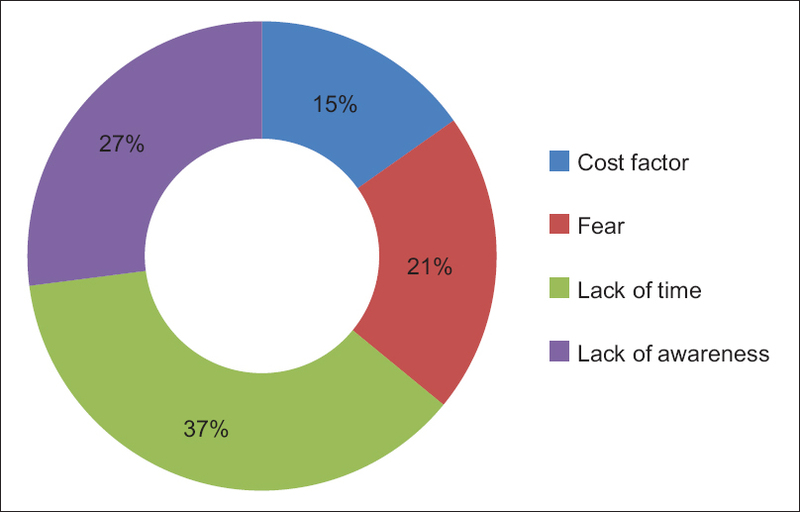 Around 17% of students, toothache was the driving factor for their last dental visit which was in contrast to the study conducted by Baseer et al. among health professionals were 35.4% of the students have toothache as their driving factor for last dental visit. Visiting the dentist is still not considered as preventive dental behavior, at present, it only depends on the treatment needs. Overall, the knowledge among the pharmacy students in this study was good although they had deficits in knowledge of few areas such as flossing, regular visits to the dentist, and selecting dentifrices. Hence, oral health awareness among the pharmacy students should be increased to educate the patients and the community when they begin working in the health-care system. More workshops and continuing professional development recognized oral health courses could be conducted by the manufacturers and professional dental organizations in the future to motivate the pharmacists to update their dental knowledge. The present study shows that the pharmacy students have a positive attitude towards oral health despite having poor knowledge and mediocre practice principles regarding oral health. There is a definite need for the students to improve their knowledge as the demand for oral health services in community pharmacies is increasing. Hence oral health education must be included in pre -clinical curriculum of paramedical courses.Furthermore, oral health awareness among these students should be increased. These professional students must be encouraged to be good role model in proofing oral health education among their family, friends and their parents. Usman S, Bhat SS, Sargod SS. Oral knowledge and behaviour of clinical medical, dental and paramedical students in Mangalore. J Oral Health Community Dent 2007;1:46-8. Kaur S, Kaur B, Ahluwalla SS. Oral health knowledge, attitude and practices amongst health professionals in Ludhiana, India. Dentistry 5:315. doi:10.4172/2161-1122. Rajiah K, Ving CJ. An assessment of pharmacy students' knowledge, attitude, and practice toward oral health: An exploratory study. J Int Soc Prev Community Dent 2014;4 Suppl 1:S56-62. Kumar S, Busaly IA, Tadakamadla J, Tobaigy F. Attitudes of dental and pharmacy students to oral health behaviour at Jazan University, Kingdom of Saudi Arabia. Arch Orofac Sci 2012;7:9-13. Nirmala SV, Quadhar MA, Veluru S, Tharay N, Kolli NKR, Niramala SV, et al. Oral health behaviour among medical, dental and paramedical students - A cross sectional study. Caribbean J Sci Tech 2015;3:774-80. Mohid-Dom TN, Said SM, Abidin ZZ. Dental knowledge and self reported oral care practices among medical, pharmacy and nursing students. J Sains Kesihatan Malaysia 2009;7:13-23. Baseer MA, Alenazy MS, AlAsqah M, AlGabbani M, Mehkari A. Oral health knowledge, attitude and practices among health professionals in King Fahad Medical City, Riyadh. Dent Res J 2012;9:386-92.